Toms River officials said the township’s ocean beaches lost about 85 percent of the sand that made up their makeshift dunes during this week’s nor’easter, and are anticipating sand to be brought in by the end of the week to shore up some weak areas. 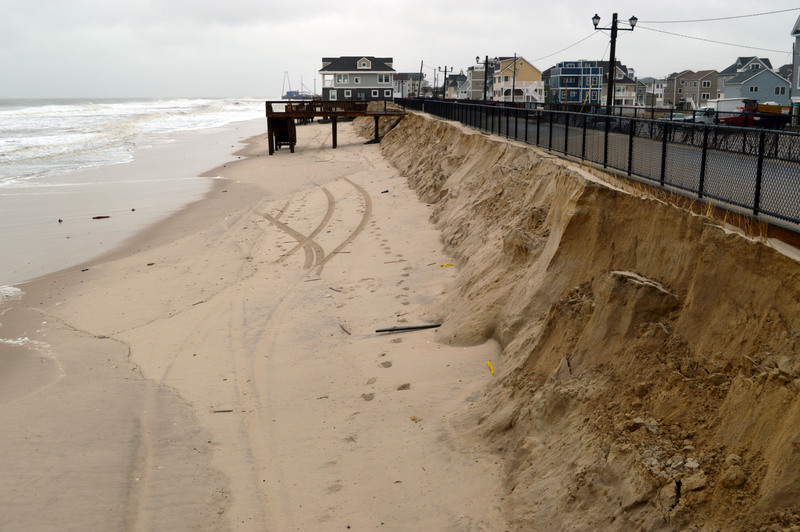 Both Ortley Beach and the north beaches – especially Normandy Beach – were affected by the storm, which cut steep drops in the sand berms the township put in place while waiting for a large-scale federal beach and dune-building project to begin. A contract for the dune work was recently awarded by the U.S. Army Corps of Engineers, and township officials are pleading with their state and federal counterparts to begin the project in Toms River. Amoruso said, in preparation for this winter season, crews took the last several years of experience and applied it to build the best dunes possible. A prevailing south wind for much of the fall season, and a lack of fall nor’easters, helped keep enough sand in place to stave off the ocean in the Jan. 23 storm. The township said Tuesday that Cardinal Construction will be importing sand starting this Thursday to shore up the dunes in Ortley Beach and Normandy Beach.